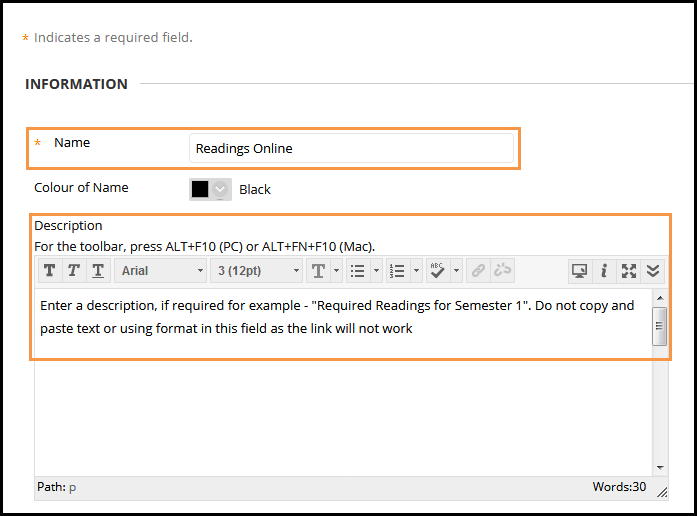 The first time you use Readings Online for your subject, you will need to create a link between your LMS subject and the Readings Online database. You may also need to recreate the link when you get a new LMS subject at the beginning of the year or semester. 2. 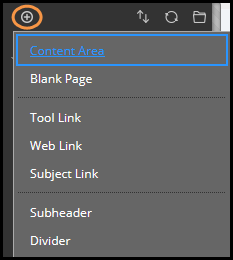 Click on the “+” on the left hand side bar and select Content Area. 3. Type Readings Online in the dialog box (or if you prefer you can use another name for your subject readings). Tick the Available to Users box. Click on Submit. 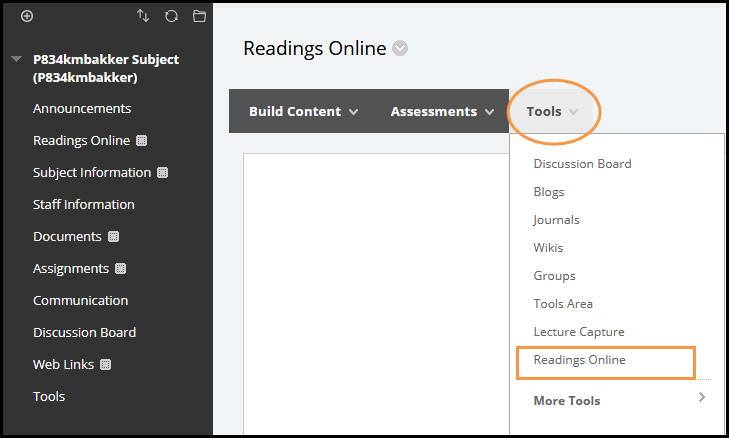 A link to Readings Online will now appear at the bottom of the LMS menu on the left hand side.You can move the Readings Online link, if desired. 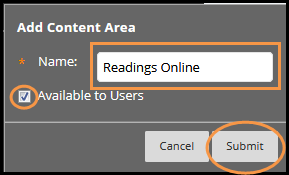 Hover the mouse over Readings Online, click on the arrow on the left hand side and then drag and drop the Readings Online item to the new position in the menu. 5. Fill in the details of what the link should be called and include a description if desired. Note, if entering a description do not copy & paste or format text as this will cause the link not to work. 6. Scroll down to Options and select Yes to Permit Users to View this Content. Scroll down to the bottom of the screen and click Submit. 7. Click on the ON button to turn off the edit mode and make the Readings Online link live. 8. Click on the Readings Online link to access Readings Online. 10. Select your preferred Citation Style from the Citation Style drop down list. 11. Click on Update to save your selection and open your Readings Online library. 12. You are now ready to create your list. See Create new reading list.